Use every second of your tanning time wisely. 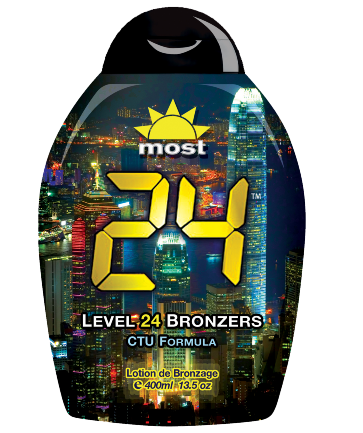 24 is an ultra bronzing formula with level 24 bronzers for maximum results in every tanning session. The CTU Formula (Continuous Tanning Utopia) is supported by a Biotanning Complex for an intense lasting tan. A skin firming emulsion tightens and tones while an energy boost of caffeine, Taurine and Pomegranate extract provide antioxidants for a fresh radiant tan. If you don''t use 24 tanning lotion,"You Don't Know Jack!"